(NaturalNews) By now, people are well aware of the dangers behind eating foods that have been treated with pesticides. The Centers for Disease Control and Prevention (CDC) states that approximately 1.1 billion pounds of pesticide active ingredients are used annually in the U.S., and the EPA says up to 20,000 U.S. agricultural workers are diagnosed with pesticide poisonings annually. Choosing organic produce at the market and even growing fruits and vegetables in the backyard are safe and favorable options. However, when growing foods in the yard, there's often the matter of having to fend off pesky intruders that chomp away at foods and even harm the entire crop with disease. Here are some ways to safely grow foods in the yard. 1.) Plant marigolds. They emit an odor that many pests avoid and is the reason many gardeners plant them around the perimeter of gardens. 2.) Buy ladybugs. 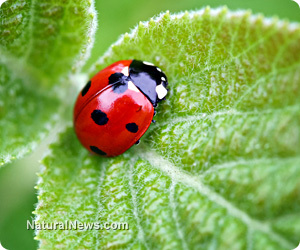 Many garden centers have ladybugs in bulk which can be purchased as a natural aphid controller. 3.) Create homemade concoctions. Many gardeners have been successfully maintaining their home-grown produce by turning to homemade, natural pesticides. For example, a mixture of Himalayan salt and a gallon of warm water can treat areas infested with spider mites when sprayed on the areas in question. If ants are a concern, break out citrus essential oil and combine it with a teaspoon of cayenne pepper and one cup of warm water. Then shake the mixture and spray. 4.) Consider hanging a bat house. Forget the scenes from scary movies. Bats don't harm people and since they can devour hundreds of kinds of insects every hour, they're good to have around. Be sure to hang the bat house at least 15 feet from the ground in a location that receives at least six hours of sunlight daily. 5.) Plant peonies. Not only do they look pretty, but they attract a wasp that eats the larvae of grubs. Natural methods like these are a safe way to keep pests away from the garden so people can enjoy fresh foods without exposure to pesticides.